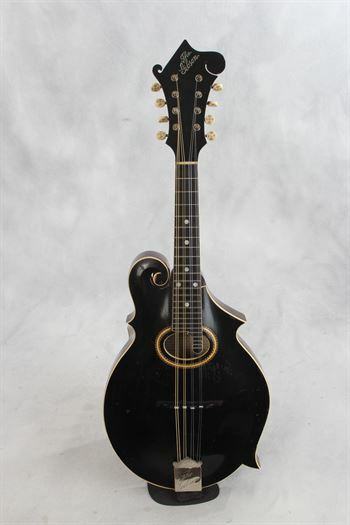 Gibson (used, 1910) F2 Blackface Three Point Mandolin - Mandolin Brothers, Ltd.
#9967, in “very good plus” condition, with the original hard shell case. In the world of fine oval-hole mandolins, there is nothing more beautiful than the Victorian-design longer-body three-point blackface Florentine model. This instrument measures 26 5/8 inches tip to bottom, (measured from the back), the body width is 10 ¼”. Having the third point on the bass side of the body, under the large body scroll, results in a body that’s longer than the F-2s and F-4s that came later. Its compelling design can be attributed to the earliest models invented by Orville H. Gibson starting in 1894. The treble top point faces slightly downward. The treble bottom point is the point that Gibson continues to use – it remains unchanged from later models. In the year 1910 Gibson made the transition to 2-point. The original first era version of this model (starting from 1902) had a pickguard that was inlaid into the face; in the year 1904 the model received the “The Gibson” pearl inlaid script headstock logo on a polished ebony overlay, the fancy individually inlaid Handel pearl, nickel-silver and wire ivoroid tuner buttons that everybody loves, and that were discontinued in 1918. The F-2 mandolin has an ivoroid bound top and fingerboard, a fancy soundhole rosette comprised of rope marquetry (amber and ebony) surrounding a ring of grained ivoroid, a bound oval soundhole, dotmarker mother of pearl fingerboard inlays, a crown shaped slide-on “The Gibson” tailpiece cover with floral etching, and a one-piece (with modified saddle inserts for better intonation) ebony bridge with compensated saddle. The original hard shell case is black with red plush interior – with a double diamond on the case pocket; it is missing its locking clasp latch but is otherwise in great condition having its original handle. This example shows light scuffs and dings on the top, a repaired soundhole binding crack (at the twelve o’clock position), light finish checking along the grain lines and a footprint of the former location of the bridge. The back also shows light signs of wear, a scar from where the pickguard was clamped and a repaired crack at the treble side upper point. Our repair shop will has replaced the binding on the treble side of the fingerboard (which was partially missing when it arrived). The back of the neck shows finish cracking along the “skunk stripe” and slight discoloration from hand-wear. The headstock shows light but normal wear mostly on the back – the face is exceptionally clean. Our friend (and author) Paul Fox writes to us with this helpful bit of information regarding the pickguard that originally came with this mandolin when it left the factory: "As far as the 1909-1910 3-point F-2 that we spoke about, I’ve attached a copy of Lewis A. Williams’ patent for the elevated finger rest (as he called it). As you will see, Williams’ design is much different than anything that Gibson used after 1910, so what you have is the transitional F-2, that had the “patent pending” pickguard. I’ve also attached pix of another example showing the two violin chin-rest clamps that were used originally [images shown in photo section]. Your F-2 clearly shows marks where there were 2 clamps, plus the fact that the 2” spread between the fingerboard holes for the mounting pins also confirms it had that design. Also attached is Gibson’s catalog illustration of the early design. It’s from Gibson’s 1907 Catalog “E” when Williams had first applied for the patent, but it wasn’t awarded until 2 years later." Finding a three-point, blackface, F-2 mandolin of this era and condition – especially one so rich, warm and articulate as this one is – can be the culmination of the life-long quest for any collector of Gibson mandolins. This example is uniquely wonderful both in its extraordinary and even visionary appearance, but also in its superlative sound and comfortable playability. The mandolin is being played by Pete Becker.